It was another case of a Biblical prophecy coming true (Matthew 10:21) when a 13-year-old boy savagely ended the life of his mother in Berkshire district in Westmoreland, Wednesday evening, shattering what the police described as relative calm in the parish. 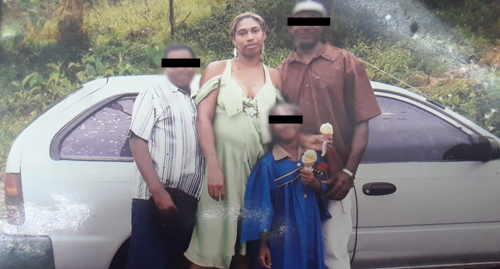 The deceased has been identified as 42-year-old farmer Patrina McDonald; while her 13-year-old son is now in police custody facing the capital charge of murder. The Bethel Town police, who are probing the incident, reported that about 7:20 p.m., McDonald was in her room watching TV, when her son, armed with a knife, entered the room and used it to stab her several times and cut her throat. The police were alerted and on arrival, they discovered McDonald’s body with multiple stab wounds. Its throat was slashed, and she was lying on her back on the floor, eyes opened, in a blood-soaked sheet. McDonald’s body was later taken to hospital, while her son was taken into police custody. The suspected murder weapon, a chef knife, was reportedly found on the body. The boy initially contradicted the police report, when questioned by the lawmen, relating that an unknown male who entered the family’s Berkshire home used a knife to stab his mother all over her body and attempted to run from the house,when he held onto the knife which cut him in his palm. The boy said he managed to wrest the knife from the man before he escaped. He, however, subsequently recanted that initial story and confessed to carrying out the gruesome act. The Western Mirror has since received reports that McDonald is reported to have scolded her 13-year-old son after he was involved in a dispute with an older brother. The boy, in a fit of rage, retaliated, using the knife to stab his mother all over her body, before cutting her throat. Gary McKenzie, Superintendent in charge of Westmoreland, says while the gruesome death of McDonald had shaken up the parish, outside of that, the division remains relatively quiet at this time. He says, however, that there are several serious hot spots, which are receiving specialized attention, especially with the deployment of additional Jamaica Defence Force personnel to the parish to complement the efforts of the police. The areas include Savanna-la-Mar, Negril, Whitehall, sections of Frome, Morgan’s Bridge,Grange Hill, Bethel Town and Little London. Westmoreland’s top cop says the police will be relentless in their efforts to crack down on criminal acts and violence. The deployment of the additional military personnel is part of a massive island-wide security operation aimed at reducing the level of murder and violent crimes heading into the festive season and breaking and dismantling the gangs and gang activities which have persisted in the targeted communities.